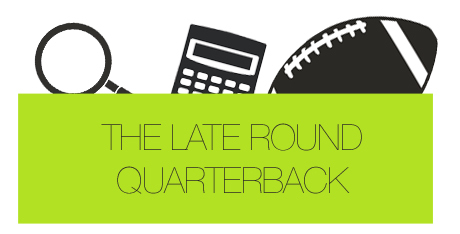 I’m not a fan of drafting a tight end early, and it goes back to the basics of my late-round quarterback strategy. When there’s just one tight end on each fantasy team, there’s less variance between the best and worst at the position. I get it, though. Jimmy Graham and Rob Gronkowski clearly separated themselves from the rest of the pack last year. But the main reason they were so valuable was because they weren’t early round picks. This year, they are. And because of that, you would need them to continue to produce at a mega-high level in order for them to be valuable. When you take a look back at 2011, the difference between the third tight end, Aaron Hernandez, to the 10th tight end, Brent Celek, was a measly 26 points. What’s that tell us? Well, if we’re not getting Gronk or Graham, we should probably wait on a tight end. There’s really no reason to reach for a 20-point difference across an entire season. Remember, fantasy football is all about value. If you can get a tight end in the 11th round who will produce Vernon Davis-like numbers, then you’re catapulting yourself above the team that drafted Davis in Round 5. And it’s not all that farfetched to think that you can do this. It happens nearly every season. So with that, here’s a list of my value tight ends for 2012. It’s still early, but I think each of these players have enough upside to force you to pass up on the typical middle-round tight ends. He had 83 receptions for 777 yards last season, and ranked 2nd among tight ends with 124 targets. He’s on a team that threw the ball more than any other team in the NFL. He’s big, physical, and has talented wide receivers to take defenders away from him. What separated him from Jason Witten last year was 150 yards. And the difference between him and Jermichael Finley was 3 touchdowns. He’s very close to being a second-tier tight end, which is why his current draft value is…well…valuable. It wouldn’t surprise me if Pettigrew posted numbers similar to Vernon Davis, Jermichael Finley, or Jason Witten this year. He’s going three rounds after these tight ends, and because of this, he’s a worthwhile pick in rounds 9 and 10. We all know the phrase “tight ends are a rookie quarterback’s best friend.” I’m not sure how accurate that statement is – both on and off the field – but let’s just pretend that it is. It helps my argument. Fleener is a lot larger than you are. He stands 6’6’’ tall and weighs in at 247 pounds. On a fresh, new offense with a rookie quarterback, he could easily become the Colts best red zone threat in 2012. He scored 7 times when he was a Junior at Stanford, and 10 times when he was a Senior. His total last season was the most by a tight end in college football. You’re getting Fleener for red zone targets and potential scores. Remember, the tight end position won’t typically get you a whole lot of fantasy points. If you can get one that scores, you’re in great shape. Fleener is worth a late-round pick for upside. If he doesn’t pan out, there will be plenty of tight ends to get off the waiver wire. Rudolph has potential. He has a 6’6’’ build and is athletic enough that the Vikings plan on moving him around different formations to create mismatches this season. There isn’t much competition in the receiving game in Minnesota either, making Rudolph that much more attractive. The biggest hit on Rudolph in many peoples’ eyes isn’t the fact that he’s young, but that the Vikings signed tight end John Carlson this off-season to a 25 million-dollar contract. While they plan to use both Carlson and Rudolph in two tight end sets, Carlson has shown that he can catch the football off the line, especially in the red zone. That’s not a good thing for Rudolph’s value. Rudolph fits the mold of the athletic, new age tight end in the NFL. He’s worth a late round flier, especially in a dynasty league. In standard leagues, you may consider him as a sleeper. Tamme was the starter for 10 games in 2010 after teammate Dallas Clark went down to a season-ending injury. In each of the 10 games, he had at least 4 receptions, and in total, he finished with 631 yards and 4 touchdowns. To put that into perspective, if he would’ve played and continued his pace for an entire 16-game season, he would have finished as the second best tight end in 2010. And if it had happened last year, Tamme would’ve been the third best tight end behind only Gronk and Graham. His 8.7 points per game was pretty impressive in 2010. If he can get close to this in Denver – back with Peyton Manning – Tamme can easily finish as a top-5 tight end. I wouldn’t look at the Joel Dreesen signing as anything that will harshly impact Tamme’s value. The Broncos will go into two tight end formations often this season, with Tamme being the first option. He’s worth a shot late in a draft considering his history with Manning and Peyton’s tendency to target the tight end position. Brian Schottenheimer’s offense has helped make Dustin Keller a top-10 tight end each of the last two seasons. Now that Schottenheimer is in St. Louis, what does that tell us about second year tight end Lance Kendricks? Well, it tells us that he’s surely going to be a big part of the Rams’ offense. Dustin Keller led the Jets in targets last season with 115. I can see Kendricks doing the same in St. Louis, especially when you consider their lack of receiving depth. Kendricks has been ranked far too low given his talent. He was a second round draft choice in 2011, and wasn’t able to live up to his rookie potential due to lack of focus and a quarterback carousel in St. Louis. I expect Schottenheimer to get Kendricks his looks and make him into a potential top-7 or 8 tight end this season.